Bring a medium sauce pot of generously salted water to a boil. Peel and coarsely chop enough shallots to measure ¼ cup [½ cup]. Trim the stem ends from the Brussels sprouts; thinly slice the sprouts lengthwise. Set aside half the Parmesan for garnish. Working over 2 small bowls, crack 1 egg at a time and separate the white and yolk, carefully dropping the white into 1 bowl and the yolk into the other bowl. Save the whites for another use. [Separate all 4 eggs.] Using a fork or whisk, lightly beat the egg yolks until blended. Stir in half the Parmesan. Using the bottom of a bowl or cup, lightly crush the hazelnuts for garnish. To the pot of boiling water, add the fusilli and cook until just tender, 10 to 12 minutes. Drain, reserving ½ cup [¾ cup] pasta cooking water. Return the fusilli to the pot; drizzle with 1 to 2 teaspoons oil and toss to keep the pasta from sticking. While the fusilli cooks, sauté the vegetables. In a large frying pan over medium-high heat, warm 1 to 2 tablespoons oil until hot but not smoking. Add the shallots, season with salt and pepper, and cook, stirring occasionally, until softened, 2 to 3 minutes. 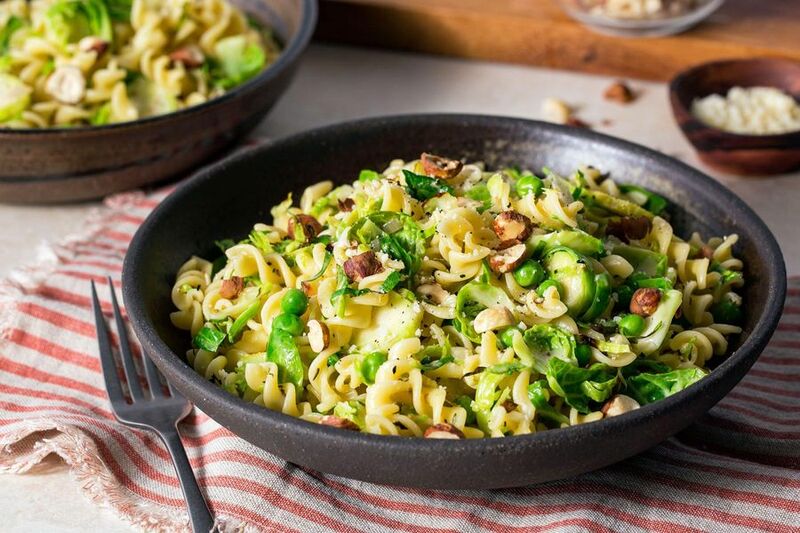 Add the Brussels sprouts and dried herb blend and cook, stirring occasionally, until the sprouts are lightly browned and tender, 3 to 4 minutes. Stir in the peas and cook until warmed through, 1 to 2 minutes. Add the fusilli and cook, stirring, until piping hot, 1 to 2 minutes. Remove from the heat, immediately add the egg yolks, and toss to coat. If dry, add the reserved pasta cooking water 1 tablespoon at a time to loosen the sauce. Season to taste with salt and pepper. Transfer the fusilli to individual bowls, sprinkle with the hazelnuts and remaining Parmesan, and serve. Sprinkle the hazelnuts and Parmesan. A creamy egg yolk sauce coats this ingenious carbonara, sprinkled with Parmesan and hazelnuts for a quick vegetarian meal. First cultivated in Belgium, Brussels sprouts resemble tiny green cabbages, and grow on long stalks. Increasingly, you can buy the sprouts still on the stalk at farmers’ markets. Calories: 650, Protein: 25g (50% DV), Fiber: 13g (52% DV), Total Fat: 26g (40% DV), Monounsaturated Fat: 16g, Polyunsaturated Fat: 3g, Saturated Fat: 4.5g (23% DV), Cholesterol: 165mg (55% DV), Sodium: 270mg (11% DV), Carbohydrates: 80g (27% DV), Total Sugars: 8g, Added Sugars: 0g (0% DV).